During the Germanna Community College Educational Foundation Scholarship Reception on March 16, 2012 at Fawn Lake, donors learned how much their uttering the words “Let me help” has meant to students they have helped attend GCC. They learned their donations are turning lives around. They learned they are giving those students a chance they might not have otherwise had to be successful, a chance to make lives for themselves and their families that they are proud of and to become good citizens in our communities. And they learned that providing those chances is making a real difference for the students, their families and our area. GCC Educational Foundation Director Mike Catell introduced one of those donors, Doris Buffett, sister of Warren, who has given $150,000 for scholarships over three years, in addition to other support for Germanna. Ms. Buffett lives in Fredericksburg and has given away $120 million of her own money in what her brother calls “retail philanthropy.” He says most philanthropy is “wholesale.” Hers is different in that she often deals with people “unlucky through no fault of their own” one on one, and stays involved in their lives, helping them turn things around. Also in attendance were Lee Kirk, president and CEO of Culpeper Regional Health System, who donated $35,000 on behalf of CRHS and the Culpeper Regional Hospital Foundation, to the Germanna nursing program at the event, and Fred Rankin, president and CEO of Mary Washington Health Care. Between the two of them, they have given over well over $2 million to Germanna, making GCC nursing the nationally respected, cutting-edge program it is and helping to double its size so it can produce the nurses our area needs. Culpeper Regional Health System’s total overall giving, includes Culpeper Regional Hospital, Culpeper Hospital Foundation now stands at more than $600,000. 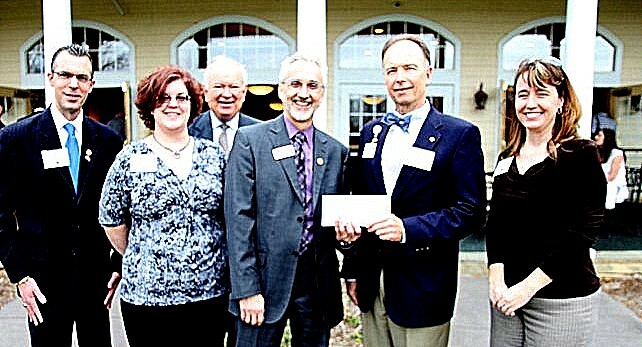 CRHS was the GCC Educational Foundation’s 2011 Philanthropist of the Year. Mary Washington Health Care has given a total of $1.4 million and is the Educational Foundation’s 2012 Philanthropist of the Year. In the crowd were students Kim and Brian Morris, who have gone from living in their car to finding themselves on the road to success, in part because of the Germanna Guarantee Scholarship Program, which helps students who don’t qualify for financial aid or have gaps in that aid that might otherwise prevent them from attending college. Kim Morris said the support has allowed her to focus on being a full-time student. She is doing so well she’s on the President’s List and was invited to join the Phi Theta Kappa honorary society. Germanna Community College students Brian and Kimberlie Morris (above) were living in their car, wondering how they were going to find their way out of a seemingly bottomless pit of despair. "Seven or eight years ago, my husband and I were actually homeless," Kimberlie said. "Going from figuring out how to pick ourselves up to be making the grades that I'm making--it's very much not where I thought I'd be at this point." The 33-year-old is on the President's List and joining the college's chapter of the Phi Theta Kappa international honorary society. She's on course to graduate with an associate's degree in business administration in December 2013. "She actually inspired me to go back to school," her husband Brian said. "This is my first semester. To go from living in our car to this..."
"It was a pipe dream," Kimberlie said, finishing his sentence. "It was less than that--it was a puff of smoke," Brian, who just turned 40, said. "When we were homeless, we were more concerned about living from day to day, trying to get back on our feet. Once we did, that pipe dream became a reality." The couple lives in Spotsylvania County. Neither of Kimberlie's parents finished high school. The Morrises said things turned around when someone was willing to rent them an apartment and allowed them to pay the deposit over time. Brian found a job and they were on their way. "You don't have a phone number," she said. "You don't have a permanent address. How do you find a job when you don't have those things?" Having been through that, they now try to help others whenever they can, even though they have little money. Because someone gave them a chance, she said, "It's been a complete, 360-degree turnaround. We didn't want a handout, we wanted a hand up. If we can do that for someone else, fantastic." Kimberlie applied to Germanna, with support from the GCC Educational Foundation. "I thought, life starts over," she said. "Things happen and you can actually go. This time I'm just going to put my foot down and see what happens. To have my dad understand and say,'You went beyond what I though you could accomplish...' "
After a stint in the military, Brian also began taking classes at GCC. "Every time I go to class, I'm early," Kimberly said. "Every time I sit down in my chair in class, I appreciate my professor's time. As soon as I get home, I do my homework. Maybe if younger students understood that... Every time I see a kid who's younger than me miss a class, I just see dollar signs. I think, 'You're just throwing your education down the toilet bowl.' Not that you don't have reasons to miss class. But it's just that I think I respect it more, having not gone directly from high school to college. "Now I'm a college student my father can brag about." Lee Kirk, President and CEO of Culpeper Regional Health Care, presents Dr. David A. Sam, president of Germanna Community College, with a check for $35,000 in support of the college's nursing and Allied Health program Friday at a scholarship reception at Fawn Lake. 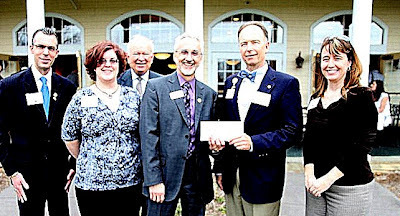 From left, Mike Catell, director of the GCC Educational Foundation, Tiffany Bell, Culpeper Regional Hospital emergency department director, Butch Davies of the GCC Educational Foundation, Dr. Sam, and Cindy Colson, executive director of the Culpeper Hospital Foundation. Kirk said CRHC and the hospital foundation have been enthusiastic supporters of GCC because of the quality of the nurses and other health care professionals it produces for the community. Germanna President Sam thanked Kirk, saying that the support of CRHC and the foundation has helped make it possible for the college to double the size of its nursing program and will make a difference for the Culpeper area for decades to come. The saga of John Kennedy Toole is one of the greatest stories of American literary history. After writing “A Confederacy of Dunces,” Toole corresponded with Robert Gottlieb of Simon & Schuster for two years. Exhausted from Gottlieb’s suggested revisions, Toole declared the publication of the manuscript hopeless and stored it in a box. Years later he suffered a mental breakdown, took a two-month journey across the United States, and finally committed suicide on an inconspicuous road outside of Biloxi. Following the funeral, Toole’s mother discovered the manuscript. After many rejections, she cornered Walker Percy, who found it a brilliant novel and spearheaded its publication. In 1981, 12 years after the author’s death, “A Confederacy of Dunces” won the Pulitzer Prize. In “Butterfly in the Typewriter: The Tragic Life of John Kennedy Toole and the Remarkable Story of a Confederacy of Dunces," Germanna Community College English Department Chair Cory MacLauchlin draws on scores of new interviews with friends, family, and colleagues as well as full access to the extensive Toole archive at Tulane University, capturing his upbringing in New Orleans, his years in New York City, his frenzy of writing in Puerto Rico, his return to his beloved city, and his descent into paranoia and depression. The book will be released by De Capo Press on March 27, 2012. There will be a signing at The Griffin in downtown Fredericksburg on from 2 p.m. to 4 p.m. on Saturday, March 31. “There wasn’t an adequate biography,” MacLauchlin, who lives in Bristow with his wife and children, said. “I found myself wanting to know more and to tell a fair story about his life, which hadn’t been done yet, as many of his friends I’ve interviewed would attest. MacLauchlin said that when publishers kept saying no, Toole “fell into a deep depression and suffered from paranoia that people were after him. He beleieved his work had been stolen and had been published under another name. Fredericksburg resident Joel Fletcher had written an earlier book about Toole and his mother titled "Ken & Thelma." Press release combines De Capo and Germanna information.